Pedestrian accidents often result in painful and debilitating injuries and pedestrians are far more likely to die from their injuries when drivers are speeding or driving in an aggressive manner. These accidents always have the potential to lower the quality of the victim’s lifestyle permanently in the event he or she survives and may even inhibit his or her ability to continue providing for a family. The Chicago pedestrian injury attorneys of Rosenfeld Injury Lawyers LLC understand the physical and emotional turmoil that these victims must face and aggressively pursue justice on their behalves. Automobiles are powerful machines that have the potential to do a great amount of harm in a collision involving a pedestrian. Because the pedestrian is out in the open, he or she is afforded no protection in the accident and is likely to suffer numerous injuries. The injuries suffered include: fractures, internal bleeding, traumatic brain injuries, injuries to the spine, lacerations, puncture wounds, degloving injuries and medical complications which arise due to the initial injuries. Even if victims’ wounds are not permanent, many may need to go through extensive medical procedures and rehabilitation in order to begin to lead normal and independent lives again. 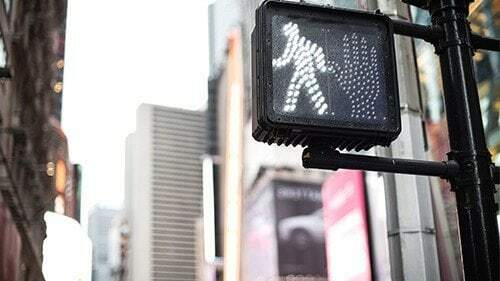 Our Chicago pedestrian injury lawyers understand the physical, emotional and financial damage caused by these injuries, which is why we fight so hard on behalf of our clients. The initial impact of a vehicle striking an individual may be enough to break or shatter bone, but additional injuries can result from being pinned between objects, thrown to the pavement or striking the hood or windshield of a vehicle. All fractures fit into two main categories— simple fractures and compound fractures. A simple fracture occurs when the bone breaks internally and remains beneath the skin while compound fractures are those in which the broken bone creates an exit wound and protrudes from the skin. Bones may also shatter into fragments due to a traumatic injury and require surgical procedures to be set back into place. Internal injuries suffered in accidents can be silent killers because they may go unnoticed by first responders or medical professionals. A victim who has suffered internal trauma may not show any symptoms, only to experience severe pain and complications later on when it is too late to prevent significant damage to major organs. These injuries can include perforations to organs, collapsed lungs, trauma to the liver or kidneys, a ruptured spleen or ruptured arteries in the heart. When not treated in a timely manner, these injuries can result in fatalities. Another form of internal injury is a TBI, which is any type of injury that causes damage to or swelling within the brain. If the victim strikes his or her head on the car, the ground or another object following impact, the brain may experience microtears that fill up with fluid or cause internal hemorrhaging. The victim may show immediate symptoms, such as losing consciousness, severe headache, disorientation, loss of memory and confusion. In other instances, the symptoms do not surface until weeks later. Traumatic brain injuries cause permanent damage to the brain that can result in the loss of cognitive function and the development of neurological disorders. Victims who suffer from these injuries may require assistive care for the rest of their lives and it is important to ensure that they can afford the ongoing cost of their care so that they can move forward from their injuries in the most dignified manner possible. Injuries to the neck, back and spine can have a permanent impact. These can include conditions such as herniated discs and broken vertebrae— for which there is medical recourse to treat— or injuries to the spinal column itself, which may impact motor function or cause permanent paralysis. Victims may be unable to move any limb located lower on the body than the location of the injury. In addition to making a permanent impact on the victim’s quality of life, his or her paralysis can be the cause of financial stress on his or her loved ones, who must provide assistive care. The average cost of caring for a loved one who has been paralyzed can easily exceed $4 million over his or her lifetime. Lacerations, puncture wounds and degloving injuries all expose the victim to immediate and long term danger. In addition to addressing the issue of rapid blood loss, doctors must make sure that the wounds did not cause any internal damage to organs or untreated internal bleeding. The open wounds also expose the victim to bacteria and other microorganisms which can infect the wound and spread to other areas of the body once blood borne. Degloving injuries are defined as the removal of the top layers of skin from the area— often the hand or foot— due to friction between the affected area and another object. These injuries are also prone to infection and victims require multiple skin grafts and surgical procedures to restore the appearance of their limb. If nerves are severed in the injury, the victims may lose feeling or experience diminished motor function as well. Infections can make bad situations much worse for victims if they spread too rapidly for doctors to control or cause damage to internal organs. If an infection is resistant to drugs or cannot be contained, the decision may be made to amputate the limb. The loss of a limb is a tragic event and results in a permanent change in lifestyle for the victim. Rosenfeld Injury Lawyers LLC understands how debilitating and tragic a pedestrian accident can be and why it is important to secure the maximum amount of compensation available on behalf of victims. The injuries suffered in these events can permanently affect the ability of victims to provide for their families, enjoy the activities that they love or function as a healthy and independent person. They may also put an undue burden on the victim’s family if he or she is unable to continue caring for him or herself. We can help increase the value of your claim through the use of expert medical professionals and economists who can provide you with the care you deserve and testimony to support the value of your long term treatment. Our award winning lawyers also have the experience and knowledge needed to build and present your case in the most effective manner. Contact us today to arrange a consultation with one of our qualified Chicago pedestrian accident attorneys to learn more about how we can serve you and what legal options are available to you. After we have had the opportunity to review the details of your case, we can let you know what we are able to do to ensure your greatest chance of a successful recovery. If for any reason at all we are unable to secure damages on your behalf, you are assured that our services will be free of charge.